Are you looking for ways to stimulate playoff ticket sales? Are you looking for a new call-to-action to energize fans? 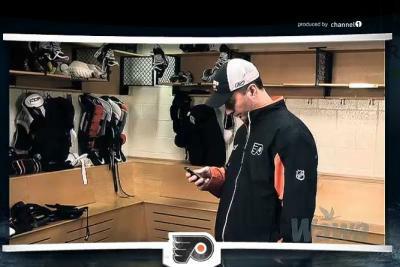 The Philadelphia Flyers recently teamed up with Verizon and Wawa to create an engaging ticket sales piece designed to serve as a call-to-action during the team's run in the 2009 NHL playoffs. The ticket promotion models the one implemented to drive ticket sales for the University of Gonzaga's women's basketball team. The Flyers called on a supporting case of players and coaches (Mike Richards, Jeff Carter, and John Stevens) to deliver the playoff ticket sales message. The video piece features a realistic setting (making one feel like they are taking in a game at the Wachovia Center) and a cool LED ribbon board feature that shows the message "Calling XXXX". Fans that share the viral piece with their friends can be entered for the chance to win a Flyers Suite. Overall, the acting could have been a little better but and the Flyers could have integrated Wawa/Verizon in a more unique fashion, but it is still a great piece. Hats off to Channel 1 Media! A special thanks to Mike Mahoney of the Carolina Panthers organization for his insights and contributions to the column.